Published on November 2, 2010 by Wade Shepard Follow me on Twitter here. 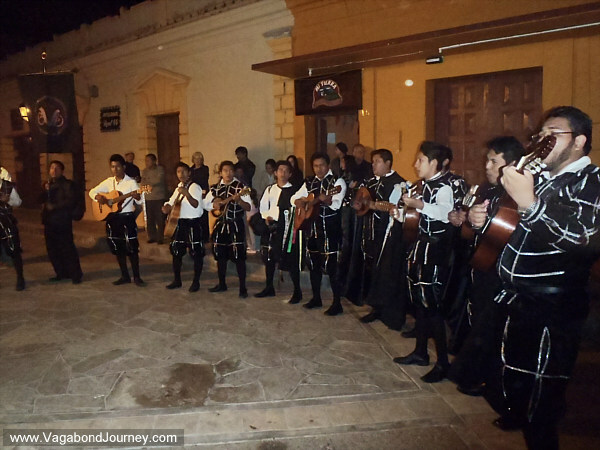 SAN CRISTOBAL DE LAS CASAS, Mexico- Halloween is not traditionally celebrated in Latin America. By “tradition,” I mean that little trick or treaters dressed up as ghouls were not roving the streets for Halloween 100 years ago. But they do now, and Halloween, or Dia de las Brujas as it has come to be called, has been congealed together with Day of the Dead, which itself was congealed together with All Saints and All Souls days by the Spanish. In point, Dia de las Brujas is essentially a fun warm up for Day of the Dead, and the people in Mexico celebrate four days and nights of festivities. On October 31st, I went out for my second night of trick or treating with my daughter, Petra, and wife, Chaya. 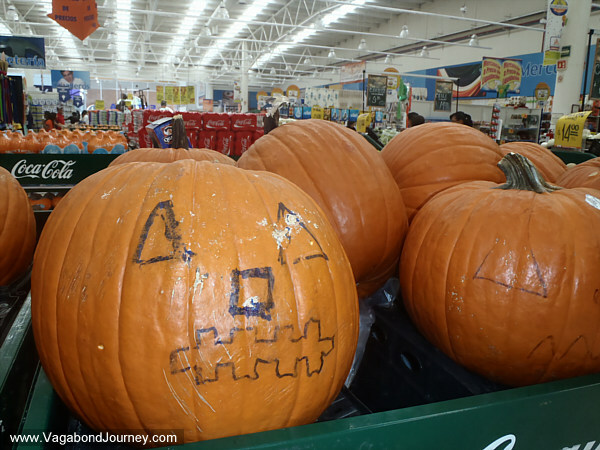 As readers already know, we found trick or treating in Mexico — or pidiendo por calabacitas (asking for small pumpkins) — to be more of a challenge than we were prepared for. We thought that dressing our girl up in a pumpkin costume would be enough to get candy. Somos los angelitos, del cielo bajamos, pidiendo calabacita, para que comamos… ¡Calabacita, tía! 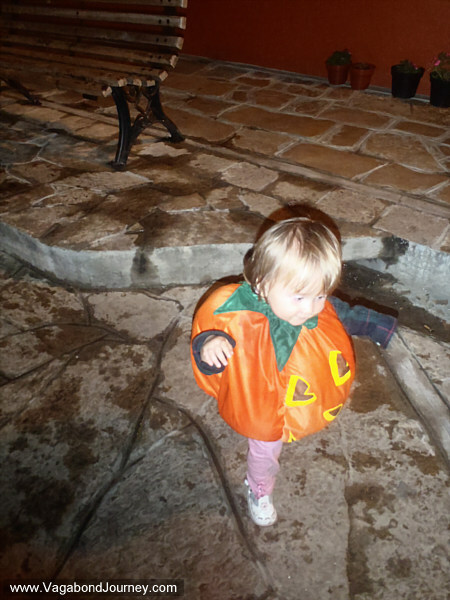 Trick or treating in Mexico begins on October 30th and runs through the night of November 2th: four nights of singing practice laid before my wife and I. Petra just had to mutter some off handed tune and look cute. Who, really, wants to give out candy four nights in a row to greedy little kids? On Halloween night we found people much more willing to fill up Petra’s candy bag, though many shopkeepers said that they only give out candy on the nights of Day of the Dead — their traditional holiday. Please watch this video, as it shows a good insight into how my days run here in Mexico. I walk down the street with Petra and she runs all over, trying to talk to people and make friends. In a more refined sense, this is what a traveler needs to do — boot shyness, introduce yourself, and find out what is going on — and I know that I can learn a little about human interaction from my one year and two month old daughter. There is this odd notion amongst Westerners that there is a dichotomy between traditional and current times. From the way we tend to speak it seems as if we think that, at some point back in history, life, celebrations, songs, and holidays were fixed into a standstill menagerie which could be viewed from the outside as being unchanging. Perhaps this is because we are a mostly literate global culture — we read of history and it seems fixed, unchanged, because our books are fixed and unchanged? Whatever the reasons for this perspective on history, it is never true: what we call traditions were really practices that were always changing, always adapting, being altered — sometimes slowly, sometimes rapidly. A stagnant tradition is a dead tradition. The same can be said of culture. It is funny to me that there widely held notions of discrediting modern traditions, of calling them unauthentic, not “traditional,” and therefore baseless. I can think of no better holiday that represents modern, capitalist, world culture than Valentines Day — a recently derived holiday perfectly started by a company. We live in a time in human history where Western culture does not seem to value itself very highly, all while looking back into the past with stars in our eyes. There is no such point in history where “tradition” stood still as a perfected whole, as we now tend to view it as being. Halloween may not have been celebrated in Mexico 50 years ago, but it is now a part of the celebration landscape of the country, it is now tradition. But then I went out into the streets of Mexico on October 31st and I saw masses of small children running around dressed up in costumes that would not be out of place in the USA on this night. They are asking for candy at each doorstep, they are trick or treating. Bands are moving through the streets, there is music. Everybody is having fun. There is no original, fixed state of human culture. There is no such thing as indigenous people, indigenous beliefs, indigenous traditions. There is no dichotomy between traditional and modern, it is all just one ongoing roll of change and adaption. A stagnant culture is a dead culture. Mexican culture is vibrantly alive. If most cultural traditions can be said to have an origin in another place, another culture, and another time than that in which they are practiced now, then I say that Halloween is a Mexican tradition as well. Halloween is said to have came from some band of medieval Celts, but, I must ask, where did they get it from? In the ongoing interplay of human culture, groups take, adapt, grow, and are changed from interactions with other groups: practices, beliefs, and celebrations always change while spinning onward into the future. This is normal. Tradition is always an ongoing event. Halloween in Mexico is a living example of this.